In December of 1968 - a year that was challenging at best - the three man crew of Apollo 8 made the first manned flight from Earth to the Moon. Although they didn't actually land on the moon (that would occur 7 months later on Apollo 11) They did experience things no one had ever seen before. This including seeing the Earth "rise" over the surface of the Moon. The photograph of this has become one of the iconic images of the twentieth century. It's important to keep in mind that NASA's astronauts weren't sent into space to take pretty pictures. The ones they did capture were in many cases unplanned snapshots that could very easily have been missed. In a new video made for the 45th anniversary of the flight, NASA has created an animation that combines the existing voice recording of the astronauts overlaid with the images they took to recreate the somewhat frantic moments that proceeded the creation of the "Earthrise" image. Frank Borman was in the process of executing a roll of the spacecraft when Bill Anders, who was surveying the Lunar surface for potential landing sites, happened to see the Earth beginning to rise out of his window. He snaps a shot of it with the camera he has, but realizing its loaded with black and white film, he calls out to the third member of the crew, Jim Lovell, to grab a canister containing color film. As the spacecraft continues to roll, the view disappears out of the small window Anders is using before Lovell can retrieve the color film. All three of them think they've missed the shot when the Earth comes into view out of Borman's window. It is through the round window of the spacecraft's hatch that the iconic image is ultimately taken. 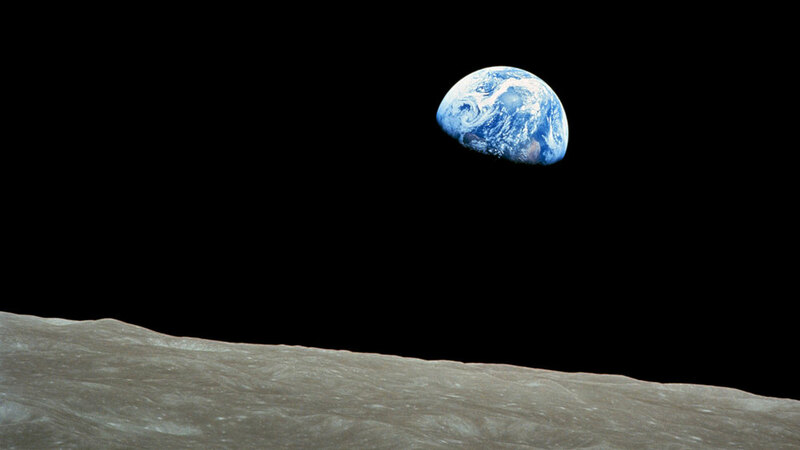 ...and from the crew of Apollo 8, we close with good night, good luck, a Merry Christmas - and God bless all of you, all of you on the good Earth.